This document is a part of the IMS Global Membership Management Service (MMS) v2.0 specification. The binding details how the Membership Management Service Information Model is realised as a Web Service; in the form of a Web Services Description Language (WSDL) file. The MMS binding is contained in a set of WSDL, XSD and vocabulary files. The vocabulary files are instances of the IMS Vocabulary Definition Exchange specification [VDEX, 04a], [VDEX, 04b]. The IMS Global Learning Information Services (LIS) Best Practice and Implementation Guide [LIS, 13b] provides non-normative guidance on how to use the Binding and Information Model. For a conceptual overview of the LIS Specification, please see the overall services description [LIS, 13a]. For a discussion of potential applications, see the Best Practice Guide. IMS Global Membership Management Services WSDL Binding Final Specification v1.0 [MMS, 04b]. 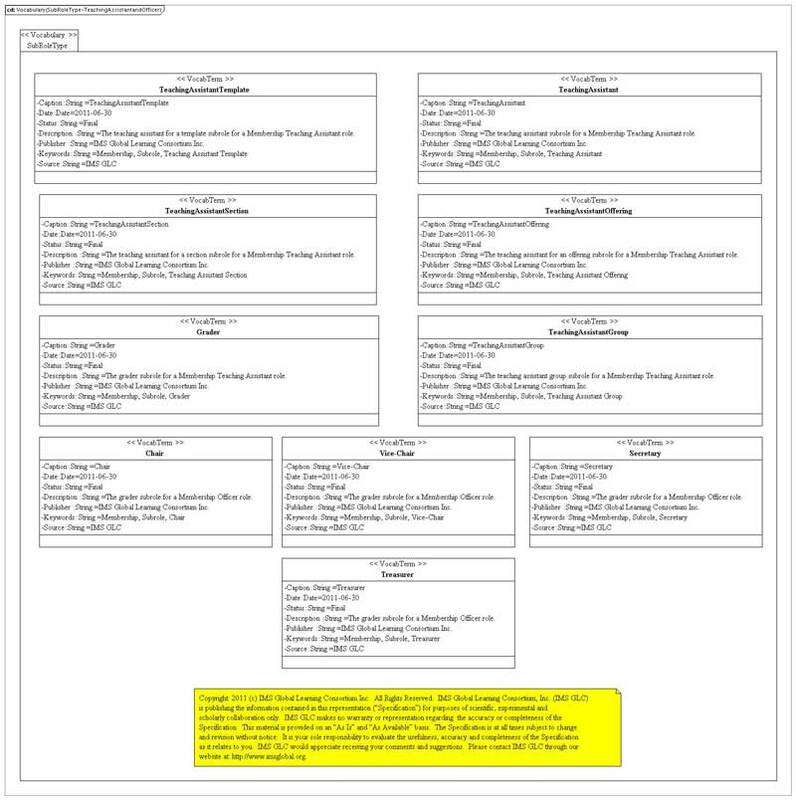 IMS Global Membership Management Services Information Model Specification Final Release v1.0, C.Vento and C.Smythe, IMS Global Learning Consortium, June 2004. IMS Global Membership Management Services WSDL Binding Specification Final Release v1.0, C.Vento and C.Smythe, IMS Global Learning Consortium, June 2004. 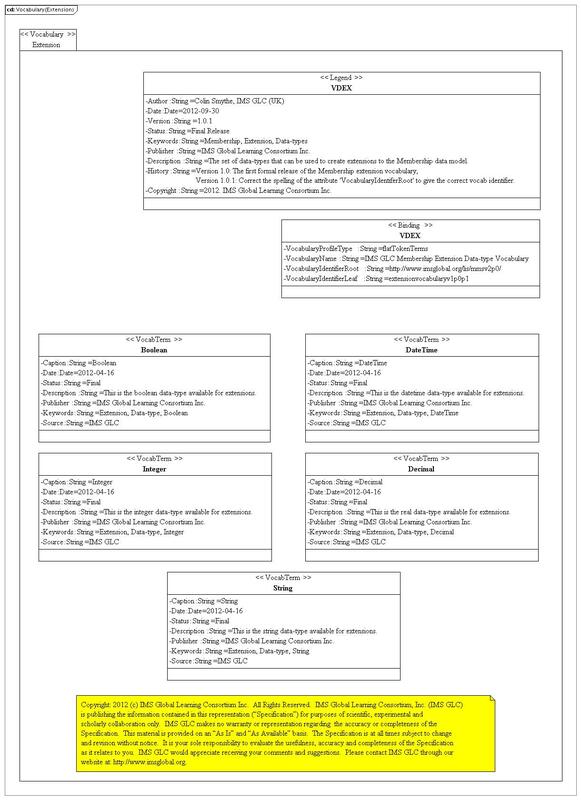 IMS Global Group Management Services Information Model Specification Final Release v2.0.1, L.Feng, B.Lee and C.Smythe, IMS Global Learning Consortium, September 2013. Figure 2.1 is the PSM of the service group model description for the MMS. This information is used to establish the mapping to the binding flavors of WSDL. Figure 2.2 is the PSM of the service model description for the MMS. The PSM is derived from the Platform Independent Model that was documented within the information model for the MMS specification [MMS, 13]. Figure 2.2 The PSM representation of the service model description for the MMS. 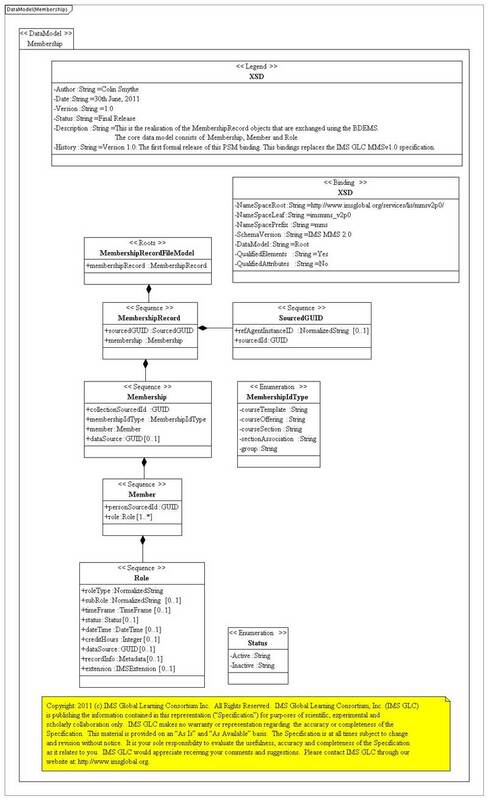 Figure 2.3 The PSM representation of the parameters data model description for the MMS. 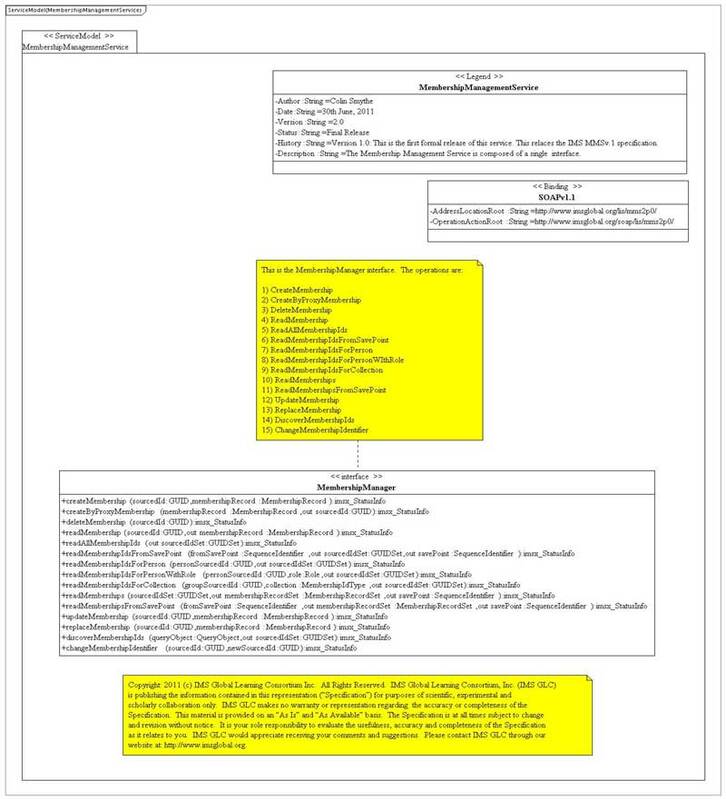 Figure 2.4 The PSM representation of the status information data model description for the MMS. The PSM for the Membership data models are shown in Figures 2.5 and 2.6. Figure 2.5 is the Group data model and Figure 2.6 contains the set of common data model classes. 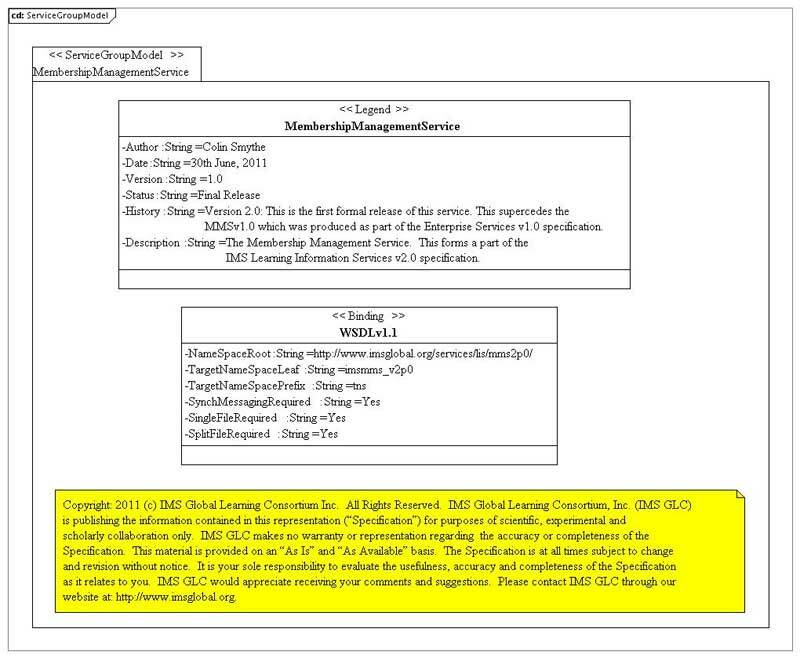 Figure 2.5 The PSM representation of the Membership data model description for the MMS. Figure 2.6 The PSM representation of the common data models description for the MMS. The PSM for the file-based Membership data models are shown in Figures 2.7 and 2.8. 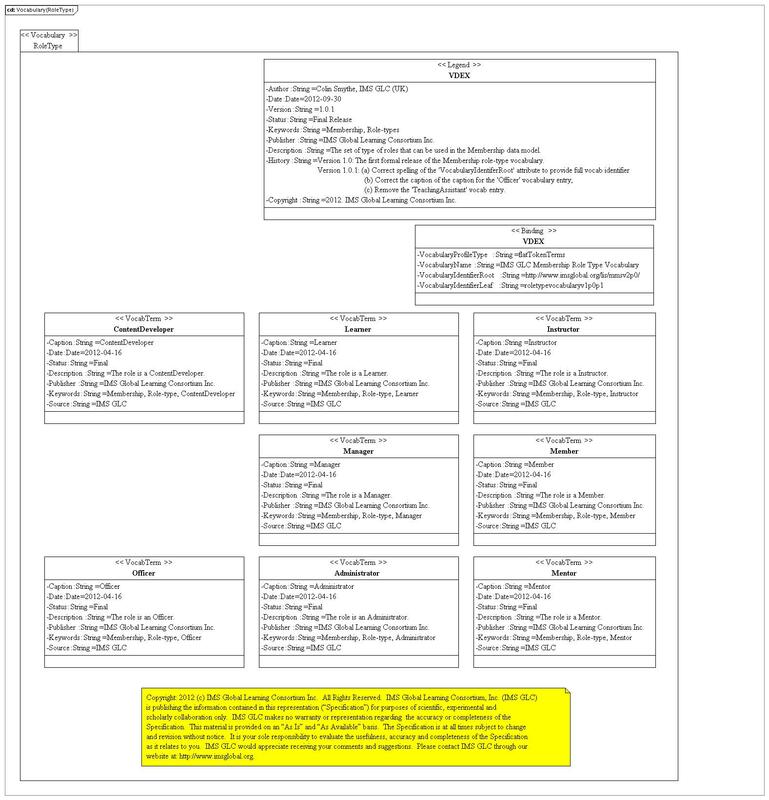 Figure 2.7 is the MembershipRecord data model and Figure 2.8 contains the set of common data model classes. Figure 2.7 The PSM representation of the MembershipRecord data model description for file storage in the MMS. 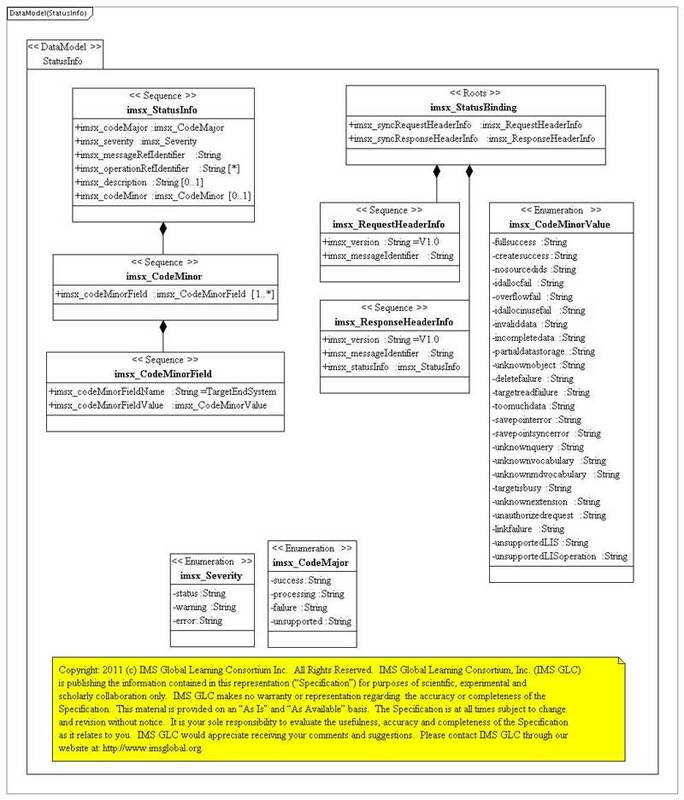 Figure 2.8 The PSM representation of the common data model descriptions for file storage in the MMS. Separated WSDL and XSD files – MembershipManagementServiceSyncWSDL.wsdl and MembershipManagementServiceSyncXSD.xsd respectively. Description: The Membership Management Service. This forms a part of the IMS Learning Information Services v2.0 specification. History: Version 2.0: This is the first formal release of this service. 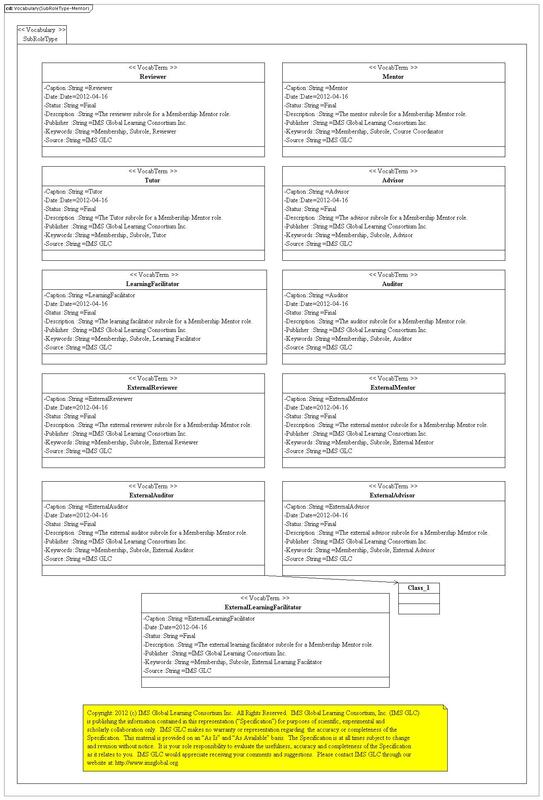 This supercedes the MMSv1.0 which was produced as part of the Enterprise Services v1.0 specification. 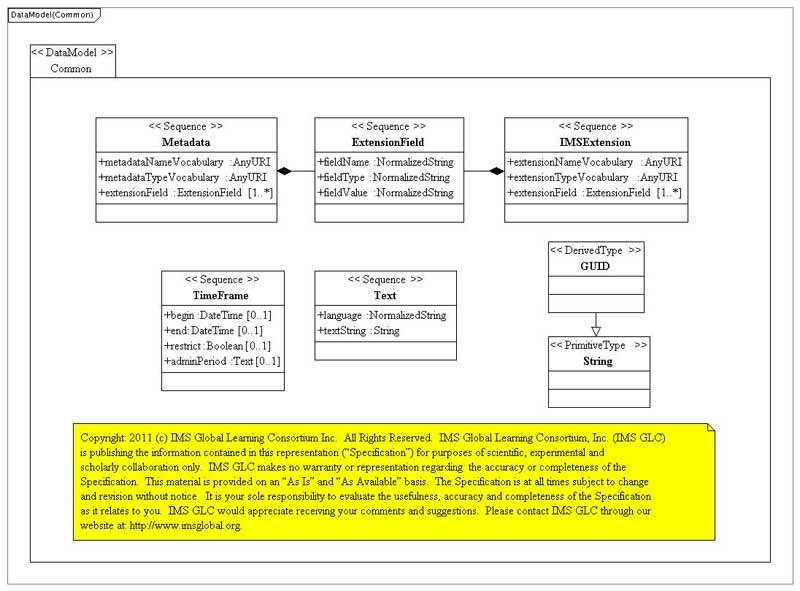 This machine readable file is derived from IMS Global Learning Consortium (GLC) specification IMS Global Membership Management Service Version 2.0 found at http://www.imsglobal.org/lis/mmsv2p0/imsmmsv2p0_Infov1.pdf and the original IMS schema binding or code base http://www.imsglobal.org/lis/mmsv2p0/immsv2p0_Bindv1.html. Recipients of this document are requested to submit, with their comments, notification of any relevant patent claims or other intellectual property rights of which they may be aware that might be infringed by the schema binding contained in this document. IMS Global takes no position regarding the validity or scope of any intellectual property or other rights that might be claimed to pertain to the implementation or use of the technology described in this document or the extent to which any license under such rights might or might not be available; neither does it represent that it has made any effort to identify any such rights. Information on IMS Globals procedures with respect to rights in IMS Global specifications can be found at the IMS Global Intellectual Property Rights web page: http://www.imsglobal.org/ipr/imsipr_policyFinal.pdf. Copyright (c) IMS Global Learning Consortium 1999-2011. All Rights Reserved. Description: The Membership Management Service is composed of a single interface. History: Version 2.0: This is the first formal release of this service. This replaces the IMS MMSv1.0 specification. createMembership, createByProxyMembership, deleteMembership, readMembership, readAllMembershipIds, readMembershipIdsFromSavePoint, readMembershipIdsForPerson, readMembershipIdsForPersonWithRole, readMembershipIdsForCollection, readMemberships, readMembershipsFromSavePoint, updateMembership, replaceMembership, discoverMembershipIds, changeMembershipIdentifier. The 'createMembership' operation is responsible for creating a new Membership object on the service provider. The service consumer supplies the 'sourcedId' to be used to identify the new Membership. The 'createByProxyMembership' operation is responsible for creating a new Membership object on the service provider. The service provider supplies the 'sourcedId' to be used to identify the new Membership. The 'deleteMembership' operation deletes the identified Membership object. This means the 'sourcedId' can then be reused for another object. The 'readMembership' operation requests the service provider to return all of the data stored for the identified Membership object. The 'readAllMembershipIds' operation requests the service provider to return the SourcedIds for all of the Membership objects. The 'readAllMembershipIdsFromSavePoint' operation requests the service provider to return the SourcedIds for all of the Membership objects from the defined reference 'savePoint'. The 'readMembershipIdsForPerson' operation requests the service provider to return the SourcedIds for all of the Group objects for which the supplied Person is a member. The 'readMembershipIdsForPersonWithRole' operation requests the service provider to return the SourcedIds for all of the Membership objects for which the supplied Person with the defined Role is a member. The 'readMembershipIdsForCollection' operation requests the service provider to return the SourcedIds for all of the objects defined by the type of collection e.g. CourseOffering. The 'readMemberships' operation requests the service provider to return all of the data stored for the identified set of Membership objects. The 'readMembershipsFromSavePoint' operation requests the service provider to return all of the data stored for the identified set of Membership objects from the defined reference 'savePoint'. The 'updateMembership' operation is responsible for changing the Membership object on the service provider by making an additive write to the previously stored data. The 'replaceMembership' operation is responsible for changing the Membership object on the service provider by making a destructive replacement of all the previously stored data. If the original object cannot be found, this operation acts as if it was a 'createMembership' operation call. The 'discoverMembershipIds' operation requests the service provider to return the SourcedIds of all of the Membership objects that sustain the query criteria. At present, there is no defined format for the query i.e. the query is passed as a string. The 'changeMembershipIdentifier' operation enables the service consumer to change the 'SourcedId' assigned to a Membership object on a service provider. 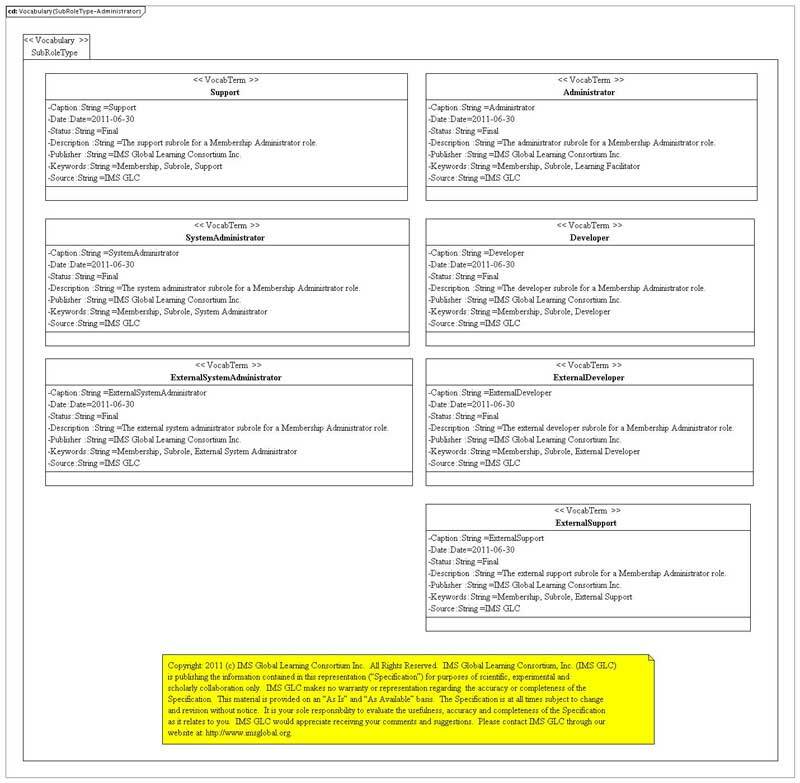 Extension data-type vocabulary – the set of data-types that are permitted for extensions in the Membership data model. The PSM for this vocabulary is shown in Figure 6.5. 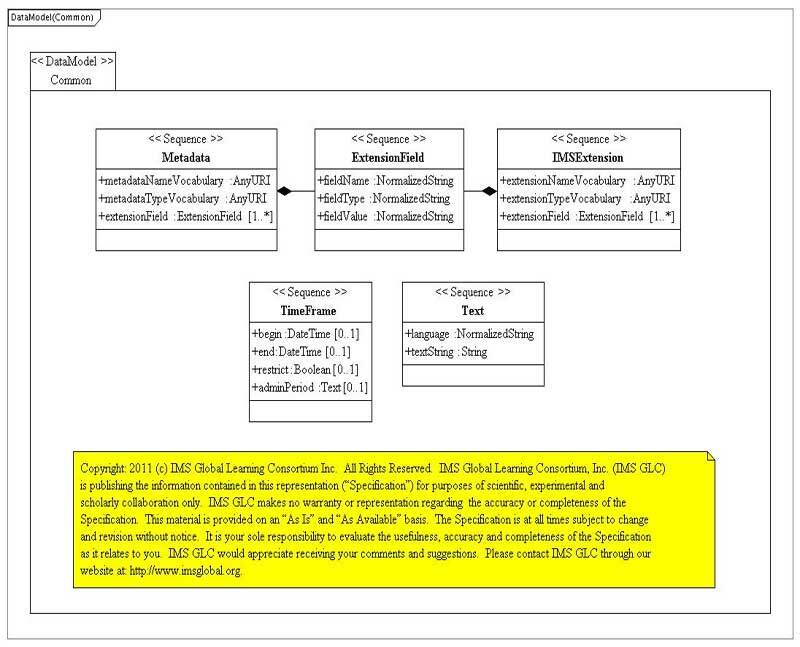 Figure 6.1 The PSM representation of the roletype vocabulary for the MMS. Figure 6.2 The PSM representation of the subroletype vocabulary for the role teaching assistant and officer for the MMS. Figure 6.3 The PSM representation of the subroletype vocabulary for the role administrator for the MMS. Figure 6.4 The PSM representation of the subroletype vocabulary for the role mentor for the MMS. Figure 6.5 The PSM representation of the extension data-type vocabulary for the MMS. Language codes – languagecodesvocabularyv1p0p1.xml. The set of codes used to identifiy the language for a string (based upon RFC4646). These vocabularies are expressed as instances of the IMS Global Vocabulary Data Exchange (VDEX) v1.0 specification. Documentation of these vocabularies is supplied in Section 6. This document contains the description of the IMS Global Membership Management Service v2.0.1 WSDL/XSD binding. This service is used to exchange information about Memberships. The business transactions include the simple create, read, update and delete of the Group data model for a single instance. This document contains the definition of the corresponding Web Service based upon SOAP/HTTP messaging. This version supersedes the IMS Global Membership Management Service v1.0 specification.